Following on from the previous post, it is now time to construct our dome! We have constructed a few domes out of PVC piping in the past, these are very quick to make with very simple tools, however due to the way the pipes are joined using cable ties they are not as strong as a geodesic shape could be and many of the PVC pipes have warped after being left out in the weather for a long period of time. Most of the details for the geometry of the dome has come from Simply Different, check it out for lots of cool information. The image below shows the marking locations for the necessary operations on the pipe. 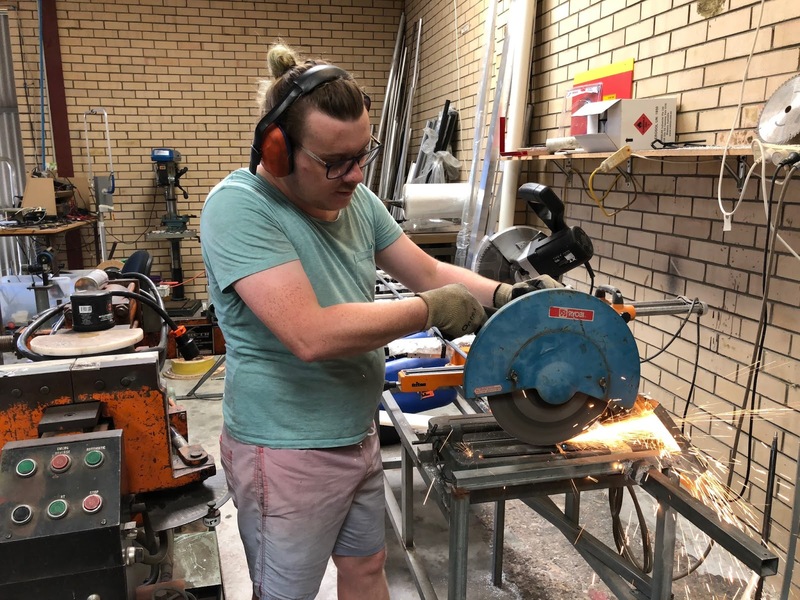 The thickness of the cut off blade has been taken into account for these cuts. This dome will be constructed out of 16mm ERW tube with a wall thickness of 1.2mm. 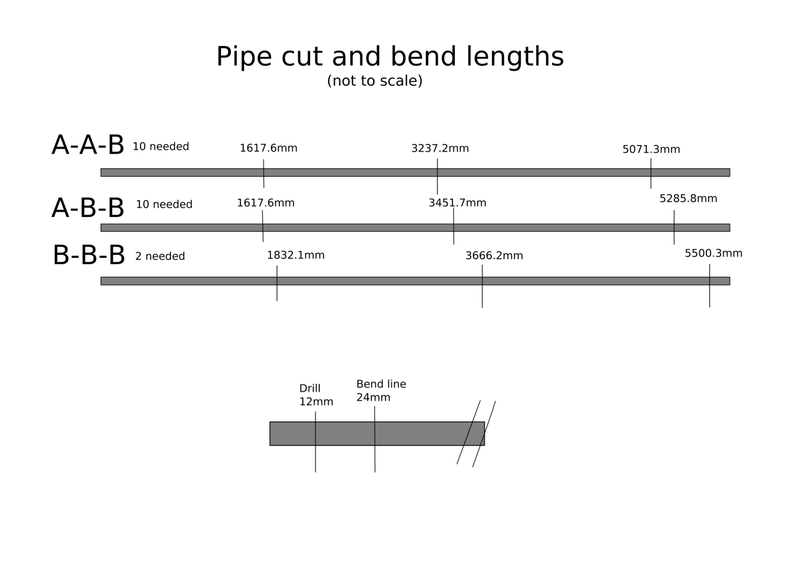 In an ideal situation we require 114.5 meters of steel tubing, however we can only buy our steel in lengths of 6.25m, so we must buy 22 lengths of this to satisfy our needs. I ended up buying 24 lengths in case we want to make a doorway into the dome. 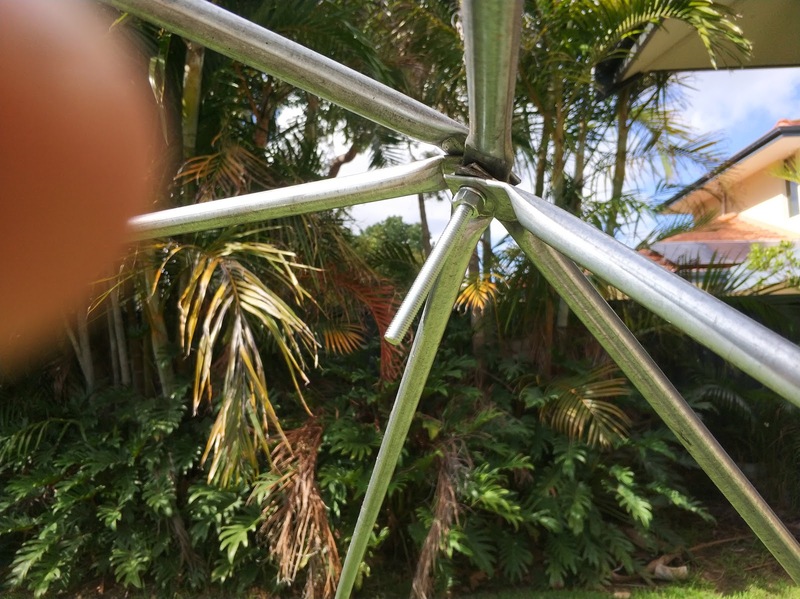 The first job is cutting our lengths of steel to the 2 different lengths required, we must be precise in our lengths as a geodesic structure relies on all the struts taking an equal load, if one was the wrong the length then it would throw out everything else and the dome will end up skewed. These cuts were done with a metal cut off saw, if you were determined you could do these cuts with a hand saw. 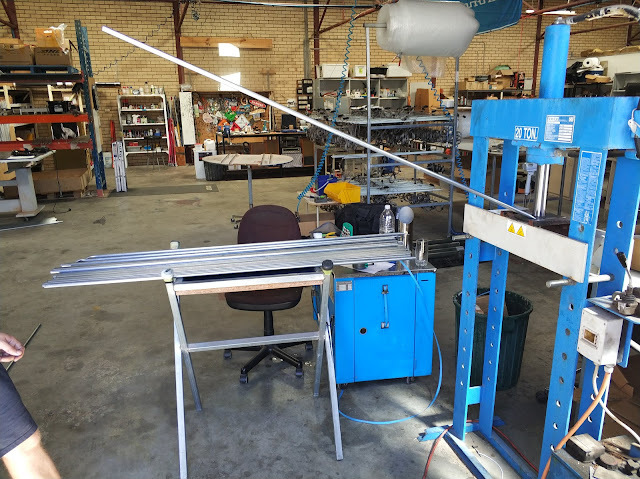 Next we need to flatten and bend the ends of our steel tubing, these bent end sections stack against each other and should sit flat against all their neighboring pipes. The bends must go in the right place and each end must be bent in the same plane if either of these are incorrect then it will make assembling the dome difficult or impossible. We flattened and bent our pipes with a hydraulic press, ideally the short lengths should be bent to 16° and the longs to 18°, lucky for us the press ends up bending the flattened ends to ~17.5°. The steel tube we used is so thin a hammer and anvil could be used to flatten and bend the pipe ends. 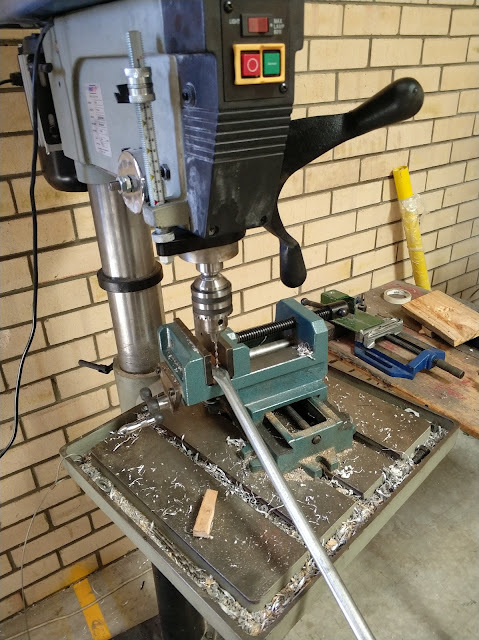 The last step is to drill holes through the bent end sections, this hole placement is important but not too hard to achieve as long as the previous steps have been done accurately. 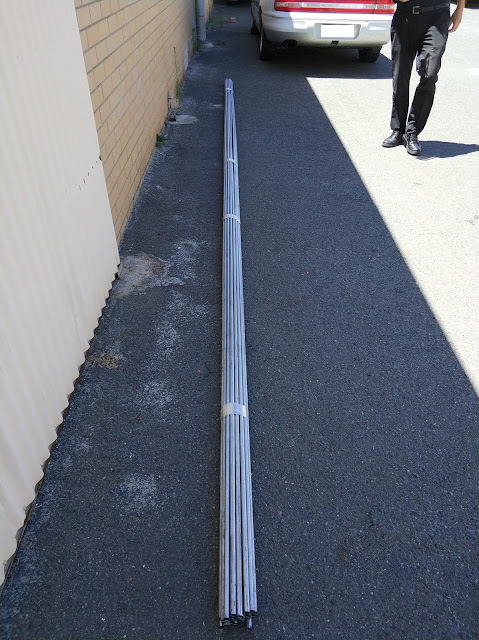 Now we have the struts we can build our dome, we used 8mm bolts to secure the pipe ends together. 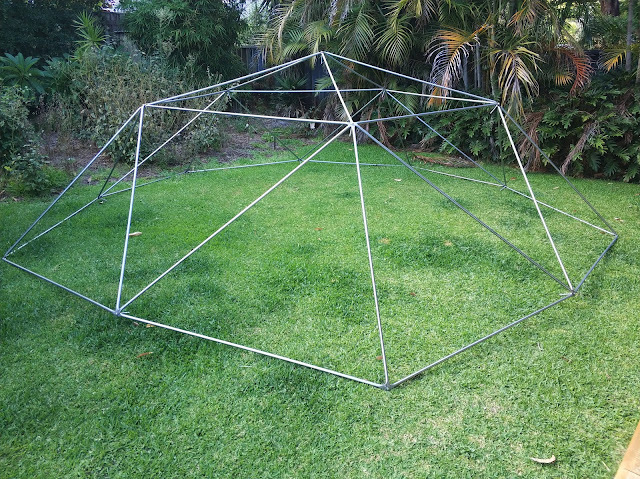 Here is part of the dome set up in my backyard, there isn't enough room for the whole thing, however this is enough to test fit all the LED panels and do some testing of the covering tarp. I'll have to wait till Blazing swan to build it in full. 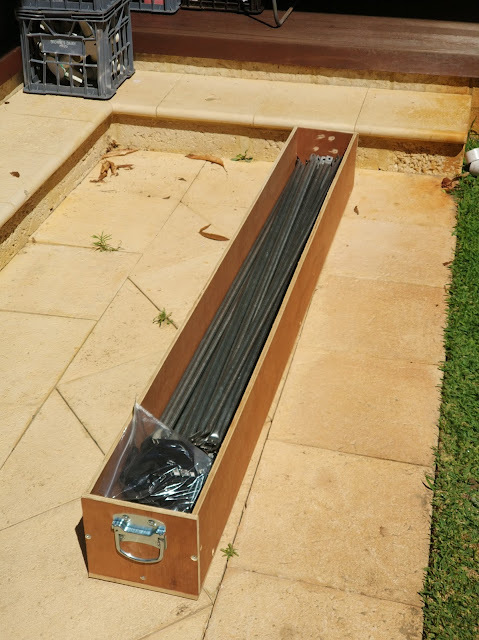 I also put together a basic box to carry the dome struts. It's made of 12mm marine plywood, bolts/dowel nuts and some handles from the local hardware shop. It's simple but makes it much easier to transport. Next post I will discuss the mechanical construction of the LED panels and the associated control hardware.